As I write this, the smoke is still clearing from the raucous, beery entertainment that the commemoration of the war of American independence has become. But I don't want to get into the politics of that at the moment. I want to argue that DeOccupy Honolulu, the encampment that continues at the corner of Ward Avenue and Beretania Street, is the most persistent and pointed challenge to the political status quo in many a year. It has been the target of more than 20 raids by the police and the city Department of Facilities Maintenance (DFM), and a like number of arrests, including the first eight on Nov. 5, 2011, when the encampment began. The raids have come at 3 a.m.; they have come in broad daylight. Armed personnel and heavy equipment accompany the raids. Although the pretext of the raids is the enforcement of Bill 54 (now ordinance 11-029) which is about "storing property," neither the Honolulu Police Department nor DFM bother following the ordinance or obeying the law at all. Property, including personal possessions, pamphlets and expressive material such as signs and artwork are seized and destroyed rather than tagged and stored as the ordinance requires. 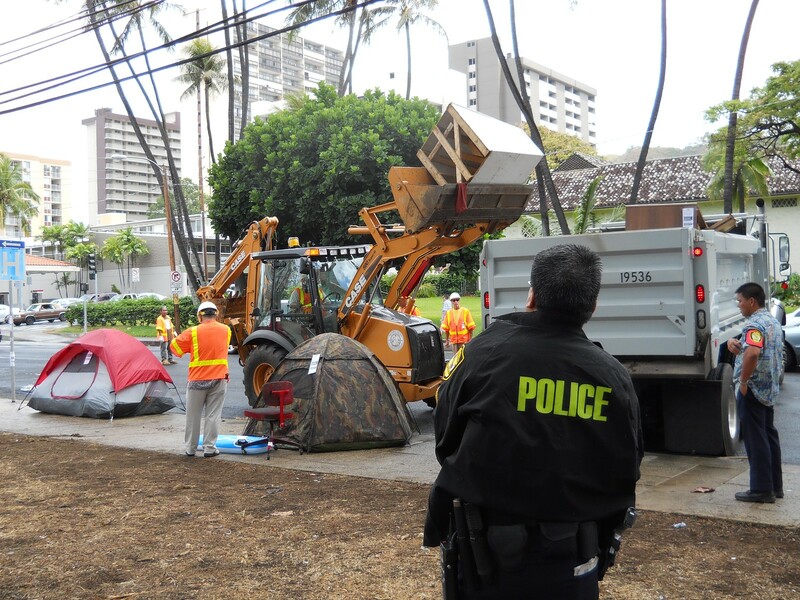 Attacking DeOccupy Honolulu is important enough for Mayor Peter Carlisle to send Cabinet-level DFM Director Westley Chun to lead the raids, along with Trish Morikawa, coordinator of Carlisle's newly created Office of Housing. Morikawa was deputy prosecutor under Carlisle when he was prosecuting attorney. These are political patronage positions, not public service positions, although the public does pay their salaries ($112,000 and $80,000, respectively). But who is DeOccupy Honolulu and why are they so important for the Carlisle administration to attack? The group is one of the many formed in solidarity with Occupy Wall Street against unprecedented social and financial inequality caused by the influence of banks and corporations on government. Carlisle is the mayor who made Honolulu appear to be the tranquilized and tightly controlled paradise for the globalized corporate entity known as APEC (Asia-Pacific Economic Cooperation) by "sweeping" away the homeless and protesters from visitors' sight. A corporate police state is still a police state, even if the police wear aloha shirts. Although the protesters come from a variety of political perspectives, all agree on the method of solution: People must come together and create solutions accessible to all. This must happen absent corporate influence; there must be a separation of corporation and state. And this is a dangerous belief to have in this day and age. DeOccupy Honolulu holds the record of being the longest running encampment in the worldwide Occupy Movement at 242 straight days, but the movement itself is a young one. Keep in mind the bigger encampments —New York, Oakland, et al. — were cleared by repeated paramilitary police actions. 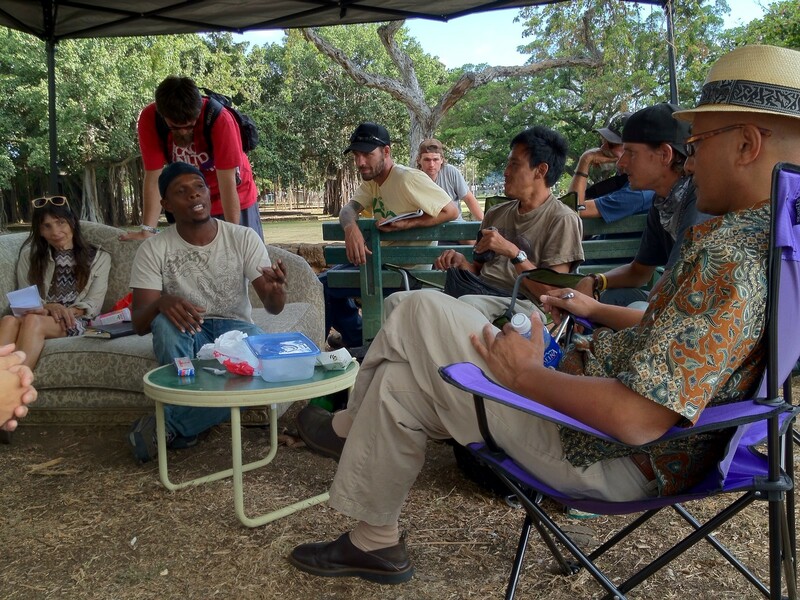 Even while under constant attack, DeOccupy Honolulu has maintained its encampment, its public forum, and its Sunday afternoon "Food Not Bombs" jam sessions; conducted a symposium in the park ("The Seeds of Sustainability," which featured a wide range of recognized experts); held two "Off Art After Dark" exhibition events; and participated in political actions, including the recent protest against corporate GMO giant, Monsanto. I don't see much political activity in Honolulu outside the corporate-sponsored political party system, so I continue to support DeOccupy Honolulu, its protest, its encampment and its efforts on behalf of the 99 percent to establish a public forum at historic Thomas Square. Anne Pau was served with an eviction notice at Haleiwa Harbor because of APEC. That night 8 pm she laid down and died. I got a call from the police department about the citation given to her. I rushed out to Haleiwa Harbor, only to learn that she died. I cleaned her camp area the next few days. Uncle John Pau, eventually left the area to live with his already crowded niece house. I still mourn her loss, one can view Annie on "Noho Hewa" she's on Keala Kellys documentary. Mahalo for giving me an opportunity to share the purpose of Thomas Square.